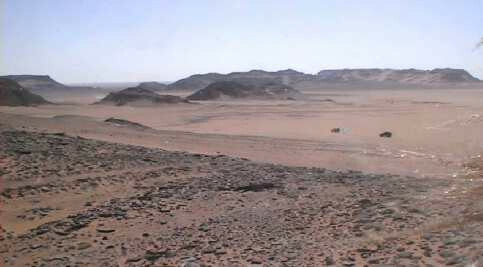 A not credible message to a so named crater "Kebira"
By wadis formed structure "Kebira"
(Boston, March 3, 2006) – Researchers from Boston University have discovered the remnants of the largest crater of the Great Sahara of North Africa, which may have been formed by a meteorite impact tens of millions of years ago. Dr. Farouk El-Baz made the discovery while studying satellite images of the Western Desert of Egypt with his colleague, Dr. Eman Ghoneim, at BU's Center for Remote Sensing. The double-ringed crater – which has an outer rim surrounding an inner ring – is approximately 31 kilometers in diameter. 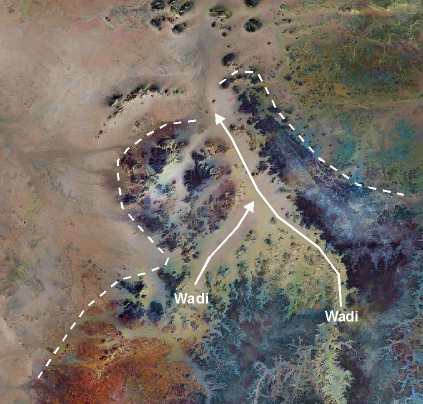 Prior to the latest finding, the Sahara's biggest known crater, in Chad, measured just over 12 kilometers. According to El-Baz, the Center's director, the crater’s vast area suggests the location may have been hit by a meteorite the entire size of the famous Meteor (Barringer) Crater in Arizona which is 1.2 kilometers wide. 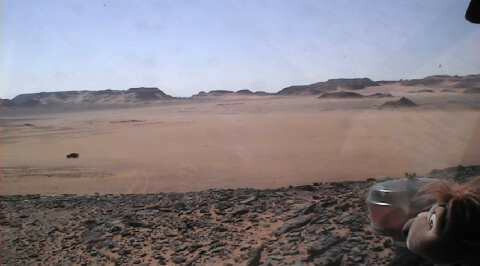 El-Baz named his find “Kebira,” which means “large” in Arabic and also relates to the crater’s physical location on the northern tip of the Gilf Kebir region in southwestern Egypt. The reason why a crater this big had never been found before is something the scientists are speculating. Where is a crater ? This structure in the northern part of the Gilf Kebir is no crater (also no impact crater). This striking structure was formed by erosion. There are no imperative references for an impact event. The researchers from the Boston University are sacrifices of an optic deceit, if they see rings or circular walls. 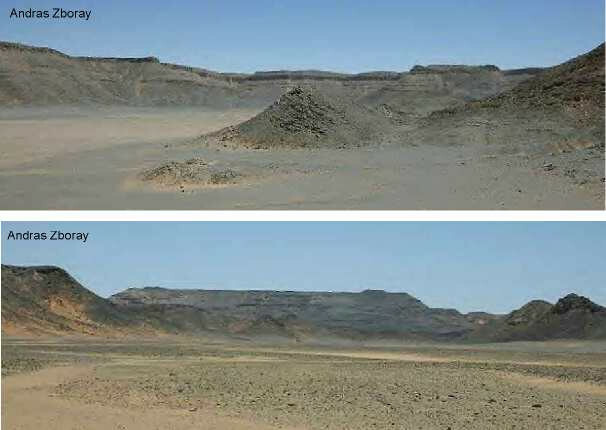 The centre of the structure does not differ from the other Gilf Kebir plateau. It is composed of fissured table mountains of Carboniferous strata. The layers are undisturbed. See the following reports and pictures. The crater "Kebira" is a great error ! First visits to clarify the origin of "Kebira"
"We continued north in the morning, rounding the western edge of the Gilf, towards a large circular feature that was recently announced to be an 'impact crater' (Kebira Crater) by Faruk el Baz and his team. We drove past the 'central uplift' along it's western edge, then drove into the central part. It is evident, that what is considered the 'central uplift' is in fact nothing more than an eroded outlier of the Gilf, the undisturbed horizontal bedding being clearly visible at all times. The circular shape appears to be pure coincidence, the whole feature is the result of drainage patterns and subsequent eolian erosion, there is nothing to suggest it's impact origin." "We were now in the crater area, looking at the western edge of the central uplift area of the "crater". What we saw were uniform horizontal layers of sedimentary rocks, undisturbed except by the processes of natural erosion. The jumbled, chaotic rock formation that we would expect to see in the central uplift area of a crater was not evident at all." The following photos has done J. Steffen at the north-eastern edge of the nonexistent "Kebira crater" (point 24°43'N / 25°02'E) and published on Wikimapia. Several subvolcanic plugs can be seen, which are further proofs that the numerous crater-like structures in the entire region have not been created by impact events. Unknown visitor in the central part of "Kebira"